Whether your SaaS company has been growing organically or through acquisition - or both – you have felt first-hand the increasing complexity of consolidations and the pressure to deliver reporting faster. The Challenge of Consolidation for Multi-Entity SaaS Companies: Take advantage of our eBook offer below. 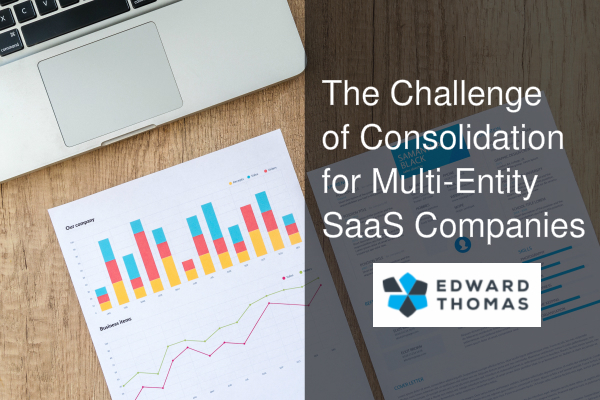 The Challenge of Consolidation for Multi-Entity SaaS Companies – Few business segments have seen the explosive growth that has occurred within the SaaS space. New accounting compliance concerns and reporting requirements have coincided with SaaS industry growth. What hasn’t changed is the management desire to have better information faster. Whether your SaaS company has been growing organically or through acquisition – or both – you have felt first-hand the increasing complexity of consolidations and the pressure to deliver reporting faster. Edward Thomas Associates is happy to offer the eBook “Next Generation Financial Consolidations for SaaS Companies” which takes a look at factors driving the complexity of consolidated reporting as well as the shortening timelines for producing financial reporting. For SaaS companies with executive accounting leadership, who wish to remain lean with minimal administrative headcount, we offer outsourced accounting services that CFOs and Controllers can rely on for timely and accurate execution of accounting duties so that they may spend their time analyzing data rather than collecting and entering data. For small SaaS companies without C-level accounting leadership we can serve as a complete accounting department providing you with all levels of accounting talent (bookkeeping, senior accountant, controller, CFO) when you need it. The best part is the affordability of outsourcing accounting services from Edward Thomas Associates and the ease with which we can scale as your business grows. Don’t let inadequate accounting resources hold your company back. Contact us today, we’d be happy to talk about your challenges and the goals you have for your business. In the meantime, we invite you to download the eBook “Next Generation Financial Consolidations for SaaS Companies” with our compliments.